11.30 a.m.: Morning Prayer, Holy Trinity Church, Rathkeale, Co Limerick. Readings: II Kings 2: 1-12; Psalm 50: 1-6; II Corinthians 4: 3-6; Mark 9: 2-9. We are about to begin Lent. Wednesday next [14 February 2018], may be Saint Valentine’s Day, but it is also Ash Wednesday. Lent is a time of preparation, so that we are ready to see Christ revealed to us in all his glory, through his Passion, Death and Resurrection. To prepare, as it were, for that time of preparation, we are reminded this morning of Christ in all his glory in this morning’s theme of the Transfiguration. There is a thread that runs through our readings this morning. The Old Testament reading (II Kings 2: 1-12) is the story of Elijah ascending in the chariot of fire in a whirlwind into heaven. The Psalm talks about God being revealed in glory (Psalm 50: 2). In the New Testament reading (II Corinthians 4: 5-12), the Apostle Paul reminds us that our eyes should be focussed on the light of the Gospel, which is the glory of Christ, who is the image of God (verse 4), and of light shining out of darkness (verse 6). If you were at the scene of the Transfiguration that day, would you have been terrified? The Transfiguration is the only Gospel miracle that happens to Christ himself. Saint Thomas Aquinas spoke of this as ‘the greatest miracle,’ because it complemented Baptism and showed the perfection of life in Heaven. It is a miracle in which Peter, James and John catch a glimpse of who Christ truly is, even before the Crucifixion and Resurrection. But if they see who Christ truly is, then, surely, Christ must see them, see us, in the moment of the Transfiguration as God truly sees them, as God truly sees us. 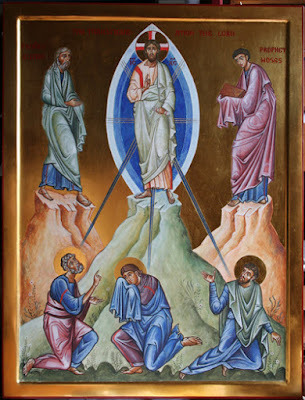 The Transfiguration is two moments: we are invited to see Christ as the truly living presence of God among us, and Christ truly sees us in the real light, as God sees us, as God sees you and me. All three Synoptic Gospels describe the descent of the cloud as an overshadowing. In Greek, this is a pun on the word for tent. But this is also the same word used to describe the Holy Spirit overshadowing the Virgin Mary at the Annunciation (Luke 1: 35). So, in a poetic way, Saint Mark is telling his readers that this is an incarnational moment, when we realise that God has come among us in the flesh, and that we, in human flesh, are called to take on the likeness of God. Christ is the focus of the Transfiguration. But who are the other principle characters in this story? 2, Moses and Elijah: They represent the Law and the Prophets, the dead and the living. 3, Three Disciples: Saint Peter, Saint James and Saint John are with Christ on the mountain top. In some ways, these three are an inner circle or a ‘kitchen cabinet’ in the Gospels. They are at the Transfiguration (Matthew 17: 1, Mark 9: 2; Luke 9: 28), they are at the raising of the daughter of Jairus (Mark 5: 35-43; Luke 6: 51), they are at the top of the Mount of Olives when Christ is about to enter Jerusalem (Mark 13: 3), they help to prepare for the Passover (Luke 22: 8), and they are in Gethsemane (Matthew 26: 37). They are a trusted group. But they also represent us at each moment in the story of salvation. We are present because they are present. The Transfiguration is both an event and a process. The original Greek word for Transfiguration in the Gospel accounts is μεταμόρφωσις (metamorphosis). It is a word that means ‘to progress from one state of being to another,’ just like the metamorphosis in which the chrysalis, the grub, becomes the beautiful butterfly. Earlier in the same epistle, Saint Paul also uses the word μεταμόρφωσις when he describes how the Christian is to be transfigured, transformed, into the image of Christ (II Corinthians 3: 18). The metamorphosis invites us into the event of becoming what we have been created to be. Transfiguration is a profound change, by God, in Christ, through the Spirit. And so, the Transfiguration reveals to us our ultimate destiny as Christians, the ultimate destiny of all people and all creation to be transformed and glorified by the majestic splendour of God himself. Some years ago , I heard Metropolitan Kallistos [Ware], the pre-eminent Orthodox theologian in England, speak of the Transfiguration as a disclosure not only of what God is but of what we are and how Christ raises our human nature to a new level, opening new possibilities. The incarnation is a new beginning for the human race, and in the Transfiguration we see not only our human nature at the beginning, but as it can be in and through Christ at the end, he said. Secular Christianity rests satisfied with our human nature as it is now. But he wants us to look to our potential, as seen in the Transfiguration of Christ. The light of the Transfiguration embraces all created things, nothing is irredeemably secular, all created things can be bathed in the light of the Transfiguration. He also referred to Revelation 21: 5, where Christ tells the Seer of Patmos: ‘Behold, I make all things new’ – not: ‘Behold, I make all new things.’ The Transfiguration is a pre-figuration of the transfiguration of the cosmos, he said. But with the Transfiguration comes the invitation to bear the cross with Christ. Peter, James and John were with Christ on Mount Tabor and with Christ in Gethsemane. We must understand the Passion of Christ and the Transfiguration in the light of each other, not as two separate mysteries, but aspects of the one single mystery. Mount Tabor and Mount Calvary go together; and glory and suffering go together. And so, from next Wednesday, Ash Wednesday [14 February 2018], I am inviting us to join in the journey of Lent, to journey with Christ, as he takes up his Cross, and moves from the Transfiguration to the Resurrection. And so, may all we think, say and do be to the praise honour and glory of God, + Father, Son and Holy Spirit, Amen. and your justice as the great deep. and give it a form like that of his own glorious body. We are the Body of Christ. We share his peace. This sermon was prepared for Sunday 11 February 2018, The Sunday before Lent.